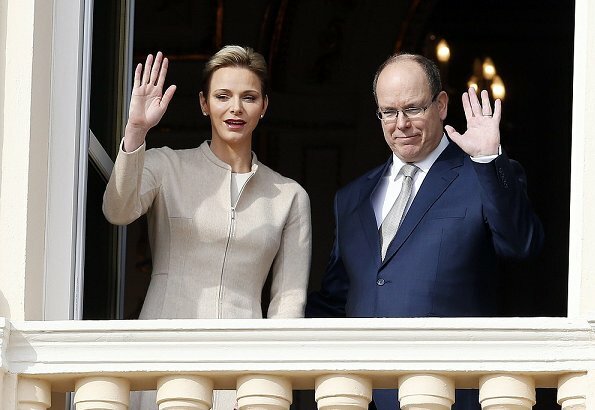 Prince Albert and Princess Charlene of Monaco leave the Monaco Cathedral during the Sainte Devote festivities in Monaco. I like how Charlene looks here, I like her in pale colors. I like the style but this beige is a tad too pale. An icy blue would bei great for her. She has great style and some of the nicest boots I have ever seen, I would love to raid her closet. She looks good in these pale colors. Hello Linda, you are right. All the others ( royalties) some have good taste and even very good one and some bad taste in clothes but none of them has style like Princess Charlene. You can buy fashion no matter how exquisite but style can not be bought or learnt you have to be born with it. Royalties doesn't have to have good taste. They have good (or bad) stylists. Jolanta U, you are wrong! Stylists collaborates with the client but the finale word is the client's word and final decision which will show the client good taste or bad one. Stylist job is to suggest NOT to force what client should wear. 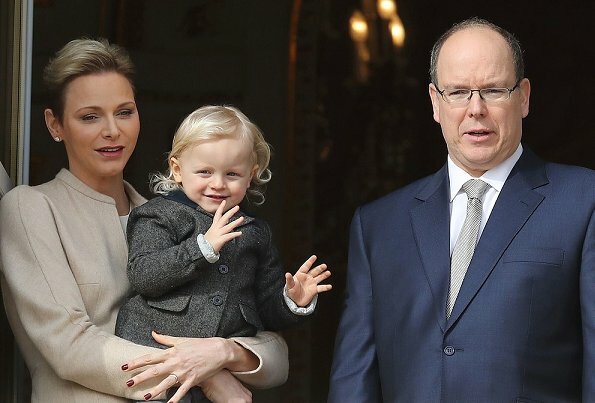 I think if Prince Albert wasn't the Prince nobody would look at him twice. That is so true, Kristina. He is not a handsome man. Personal opinions, such as those, have nothing to do with the fashions and could be omitted. Virginia D, if you would follow this blog you would know that comments here are not about fashion only but about the looks of people also. Besides that women are judged by their physical appearance constantly so why men can not be? Virginia, think of the news concerning the 60. birthday of Monacos Caroline. We talked a lot about her looks. Google photos of young prince Albert. He was very handsome. Jolanta, the comments are about his looks at the moment (photos above) not how he looked being young man. She looks great here. I even like the beige colour. Nice to see the kids. Wow Charlene is killing it!! Those boots gloves and the outfitt. Did she celebrate hrt 38 birthday she looks vrry good and hralthy!! Princess Charlene always looks great. As for Price Albert he looks very content and happy with his family. He might not be a oil painting but I'm sure he has a great personality and sense of humor. Charlene looks stunning!!!!!!!!!! Happy birthday to cha chs!! Prince Albert is not handsome. But resembles his gorgeous mother. Nothing wrong with Albert he looks good too!! Charlene nearly always looks great in clothes she has such a great figure. I do,prefer her with slightly longer hair at the back, it's just a bit too short for my liking but it does suit her. Albert is very like Grace and her side of the family. Wow!!! Gorgeous from head to toe! Love Charlene's hair and everything right down to those stunning boots! Prince Albert is very handsome. Both of them look stunning and elegant. The Princess is always dress to the T and the colours suits the occasion. She is beautiful, chic with adoring children and husband. The comment that Prince Albert is not handsome is uncalled for and extremely rude. If you think that Albert is very handsome, how would you call Felipe and Haakon? Romana both King Felipe and Prince Haakom are very very attractive and handsome gentlemen!!!!! Anna-Marie, I am pretty sure he himself would be very surprise that anyone could call him handsome or very handsome. My advice to you , make appointment with ophthalmologist asap! what is a ophthalmologist, Jack of all trades and master of none???!!! As for Charlene, I'm not a fan of the coat's hemline and there's something in her boots that I don't like (can't tell what) however she looks really chic overall. I agree with all those who say she has style. She really does stand out somehow when compared to other princesses/queens we generally discuss here (Kate, Mary, Rania, Mathilde etc.). Charlene I'd always chic period stop all the jealous nasty remarks and Albert looks good for his age! !